The divisive template built by the Left and aped by Congress is cracking. The fact that the Bharatiya Janata Party (BJP) secured an unprecedented victory in the elections to five state Assemblies is just one part of the story. The picture is, however, complete only after taking into account what the electorate did to Irom Sharmila in Manipur and to the Left in Uttar Pradesh. Between the BJP’s smashing victory and the decimation of Sharmila and the Left, hangs a tale, a milestone in the chequered saga of India’s decline and her continuing struggle to reinvent and resurrect herself. Irom Sharmila, was on a “fast” for 16 years protesting against the Armed Forces Special Powers Act (AFSPA) in Manipur. The 44-year-old contested elections in Manipur’s Thoubal constituency and secured just 90 votes. The Left front, consisting of six parties, had contested 140 seats out of 403 in UP. After independence, the Left was a force to reckon with in the state. But in the recently concluded elections, they secured merely 0.2 per cent votes. Pictures of Sharmila with feeding tubes were showcased by the ‘Left-liberal’ cabal the world over to sell a narrative that Manipur was occupied by an expansionist and authoritarian India, a la Kashmir. Now the disconnect between the anti-India narrative and the local sentiment stands exposed. Then, how does the anti-India tirade get a disproportionate currency to its traction in the society? How do the likes of Rohith Vemula, Kanhaiya, Sharmila and Burhan Wani assume a larger than life image and come to dominate the domestic and global discourse? To solve this riddle, one has to go back in history. India, accounted for 33 per cent of global GDP till the 12th century. Doubting Thomases can refer to the path-breaking works of Angus Maddison and Paul Bairoch, two internationally acclaimed economists. With Bakhtiyar Khilji sacking Nalanda and other reputed Universities in 1193, the structured system of education in India came to an end. Repeated Islamic invasions played havoc with the cultural life of the country, destroyed bulk of the existing knowledge, ended organised pursuit of scholarship and put a stop to any further research in philosophy, science and technology. After Aurangzeb’s demise in 1707, Muslim power started disintegrating. By the time Lord Clive won the battle of Plassey in 1757, India’s share in global GDP dropped to about 25 per cent. Busy fighting successive battles for their sheer survival, Hindus, the flag bearers of the original culture of this ancient land, were left with only memories of history and heritage. The 1857 uprising motivated the British to cobble together an intellectual paradigm that established them as a superior race, divide their subjects into mutually hostile groups on the basis of caste, religion, race and regions, to help them perpetuate their empire. The anglicised Indians (with few exceptions) assumed the identity and a past which the British had crafted for them. 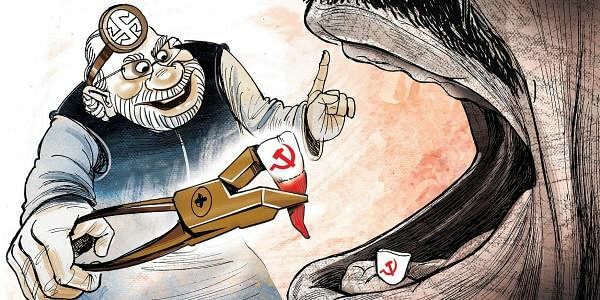 While the imported Communist movement, swallowed the British version of India, a host of leaders, including Veer Savarkar, Mahatma Gandhi, Tilak, RSS founder Dr K B Hedgewar and a bulk of the masses did not fall in the imperialist trap. Echoing the British view, Communists held India was not a nation, rather a conglomerate of several nations. No wonder that communists actively conspired with the departing British and Muslim League for the creation of a theocratic Pakistan. They still continue to pursue their divisive agenda, seek to divide Hindus in the name of caste and unite the Muslims on the basis of their shared faith, Islam. Gandhiji, saw through the British policy of divide and rule, opposed fraudulent conversion of Hindus to other faiths, worked for integration of Dalits with the rest of Hindu society and rejected the concept of class war. He did not see different castes among Hindus as conflicting identities either. Following his tragic assassination in 1948, Congress dropped Gandhian ethos and leaned towards the Left. Left. Four unrelated developments, did not allow the script on predictable lines . After Mao Tse Tung’s demise in 1976, China gradually turned into a capitalist economy under a Communist dictatorship. In 1991, Soviet Union, yet another role model for bulk of the Indian Left, too disintegrated. Taking cue from the global collapse of Communism, India opted for economic reforms leading to the emergence of news channels. The Left’s stranglehold on views and news started loosening. And now, social media has made public discourse even more inclusive. to pretend to know poverty. He was born into poverty. His pro-poor schemes have naturally more credibility with the target groups. The divisive template built by the Left and aped by Congress is cracking. Hopefully, election results will no longer be hostage to caste and religious divide. National security, pride, coupled with inclusive development are the new pass words to power.